Western culture has a nasty obsession with the murder of women. The more brutal the death, the more the fascination grows. I would like to tell you that I'm above all this and that I reject the torture of ladies as entertainment, but — as my late night Google history will show you — I'd be lying. Salivating over the details of the Jack the Ripper mystery is sinister for obvious reasons (we're exalting a man who slit people's throats and cut up their bodies as a hobby), but it's also, as New Republic writer Katie Engelhart points out, damn anti-feminist. The Ripper industry...involves very little respect, and plenty of irreverence. This is an entertainment enterprise, pure and simply. Murder is stripped of its context; victims are stripped of their dignity. And if the murders hadn't happened so very long ago, we would probably be very repulsed that a Ripper industry exists at all. Semi-professional "Ripperologists" (most of them male; see Ripperology magazine) pontificate at length about who Jack was—and why he killed. But we hear little of the victims and their exacting lives. Jack's ubiquity has veiled his crimes in myth. He now stands within a Gothic literary tradition more than a historical one: rubbing fictional shoulders with the likes of Sweeney Todd, Sherlock Holmes, Dr. Jekyll, and Mr. Hyde. And then there's the glib treatment of the story's violent sexual component. While there is no evidence that Jack raped his victims, he did give several of them crude hysterectomies. In one case, he walked off with a victim's uterus. But Ripper mythology reinforces a sense that these women had it coming. The victims were all pushers of the "four-penny knee trembler"—prostitutes. Today's Ripper tour guides give us all the titillating details. In this, the tour guides are not unlike Victorian-era journalists, who emphasized how "depraved"—and, thus, perhaps, deserving of their fate—the victims were. As Engelhart states, the Ripper tourism industry is alive and well. The Ten Bells, a pub in East London that was frequented by victims Annie Chapman and Mary Kelly, is still routinely packed with gawkers. During the 1980s, there was even a period when the Ten Bells then-owner sold Jack the Ripper t-shirts and cocktails with Jack the Ripper-themed names until feminist protesters shut it down. On any given evening, hoards of tourists follow in Jack's footsteps, along the cobblestoned streets of London's East End. Led by animated tour guides (many, in something approximating nineteenth-century attire), they duck in and out of dark alleys—and pass around fuzzy post-mortem photographs of Jack's victims: bodies with slashed faces, and missing kidneys, and peeled-off skin. The newest Jack the Ripper tours (running nightly at 7:30 p.m., at a cost of $12-$15) are more gore-drenched than ever. One tour company uses something called "Ripper Vision": basically, a handheld projector that flashes mortuary photographs onto walls or bits of pavement. "It's very modern, very different, a new way of looking at things," Ripper Vision's inventor told me. Imagine my horror when Engelhart called out "Ripper Vision," the very same Jack the Ripper tour that I went on while visiting London this past July. She's not exaggerating when she calls it "more gore-drenched than ever" either — the tour was remarkably graphic, with the guide showing us gruesome photographs of the victims' corpses throughout. As Engelhart observed, the tour shows little-to-no respect for victims Mary Ann Nichols, Annie Chapman, Elizabeth Stride, Catherine Eddowes and Mary Kelly and the way we — as participants — were commodifying these women's suffering did actually bother me several times throughout the tour. Ultimately, however, I was able to push those concerns to the back of my mind and enjoy the camp of the experience — here we were, a group of 20-odd tourists strolling through Whitechapel (which, as you may or may not know, looks nothing now like it did in 1888), being led by an actor in a bowler hat who, speaking in an exaggerated East London accent, was trying to spook us out about a series of murders that happened well over a century ago. It was ridiculous and fun. And yes, quite disrespectful. 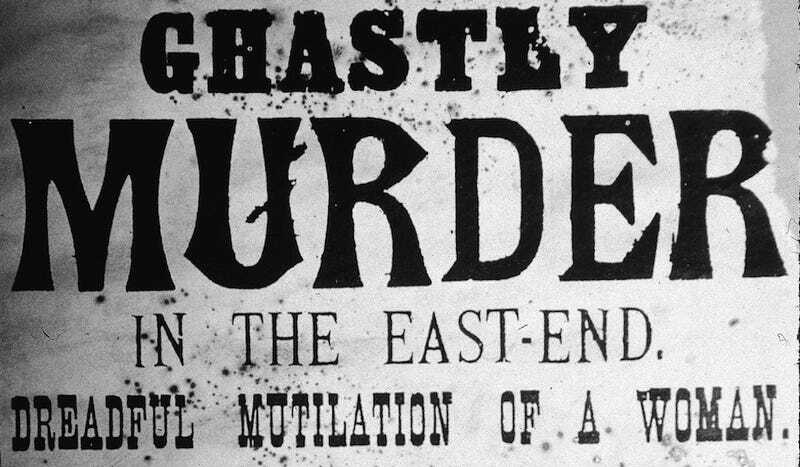 Tragedy tourism isn't unique to the sites of the Jack the Ripper murders, but the gleeful way we experience it — as Engelhart discusses — does represent an interesting factor in the way we sensationalize the violent deaths of women. American Horror Story, Law & Order: SVU, The Bletchley Circle, True Detective — all television shows that use the murder/torture of a woman (or women) as key draws and plot devices. Truth be told, I have a complicated-yet-deep love for this kind of series. I like that they cover dark topics that relate so closely to my own personal fears (fucked up as it may be) because, as many horror fan will tell you, being afraid (when you're not actually in danger) can be very entertaining. But sometimes it goes deeper than simply enjoying a dark (and, in some cases, misogynistic) TV show. There are times, usually falling between midnight and four in the morning, when I end up falling down a Wikipedia rabbit hole that somehow always ends on a page about serial killers. There was one night when I read for hours about the Black Dahlia murder and then, thanks to what I learned, hours more reading about the Glasgow Smile. Another night was wasted obsessing over the student nurse massacre of 1966. I've stayed up late reading about Ted Bundy, Peter Sutcliffe and the Night Stalker. Give me a serial killer whose victims were all women and I will read about them. In these cases, the fear no longer is fun. Instead, it's obsessive. I will always be able to lose myself in stories about men killing women (Aileen Wuornous and Jeffrey Dahmer do not have the same pull) because, although there is absolutely nothing useful about the information, I just can't seem to help myself. I don't hate women (I hope that's clear), but recognize that there's something deeply anti-woman about these stories (duh) and the way I process them. Maybe these incidents are so horrible that we have to trivialize them in order to admit that they happened. Maybe it's misogyny or a product of human bloodlust. Maybe it's all of the above. Either way, I play into it and — as the booming Ripper industry proves — I'm not the only one.